DALLAS, Texas, February 8, 2011 (ENS) – The electricity used at Cowboys Stadium for Super Bowl XLV on Sunday was offset 100 percent with the purchase of wind energy credits. For every megawatt-hour of electricity used to power the event and its associated facilities, an equivalent amount of wind energy will be generated at a wind farm in Texas, said green energy retailer Just Energy. All the electricity that powered the jumbo screens, TV cameras, the Black-Eyed Peas halftime show, and stadium lights, heated the food and cooled the beer will be generated by the Sweetwater Wind Farm located in Nolan County, Texas, 228 miles west of Dallas. The wind power offset is the result of an agreement between between Just Energy, the National Football League and the North Texas Super Bowl XLV Host Committee. Just Energy will purchase renewable energy certificates on behalf of the Super Bowl to offset all direct and indirect carbon emissions associated with power generation at major Super Bowl XLV venues. 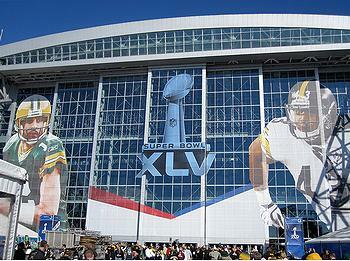 This includes energy consumed at Cowboys Stadium for the month leading up to Super Bowl XLV, electricity used at National Football League Super Bowl headquarters, the Super Bowl Media Center, the AFC and NFC team hotels, and the electricity used at the NFL Experience Football Theme Park – the largest public event at Super Bowl XLV. The offset wind energy credits support Duke Energy’s wind energy generation at its 585 megawatt Sweetwater wind farm, but the watts that powered the Super Bowl and events may not have come directly from wind energy. Just Energy also provided renewable energy certificates to green the electricity used by Aloha Stadium, host site of the NFL Pro Bowl All Star game in Honolulu on January 30. Just Energy also helped underwrite an initiative called Super Grow XLV that has planted more than 6,000 trees in 12 communities across North Texas to help offset the impact of Super Bowl events. One of the 12 is Arlington, the location of Cowboys Stadium. The Texas Forest Service has committed to matching community funding toward the initiative up to a total of $50,000.